EUR has been empowered by ZEW survey of economic sentiment and USD has been chiefly under the influence of Trump’s comments regarding the North Korea issue. 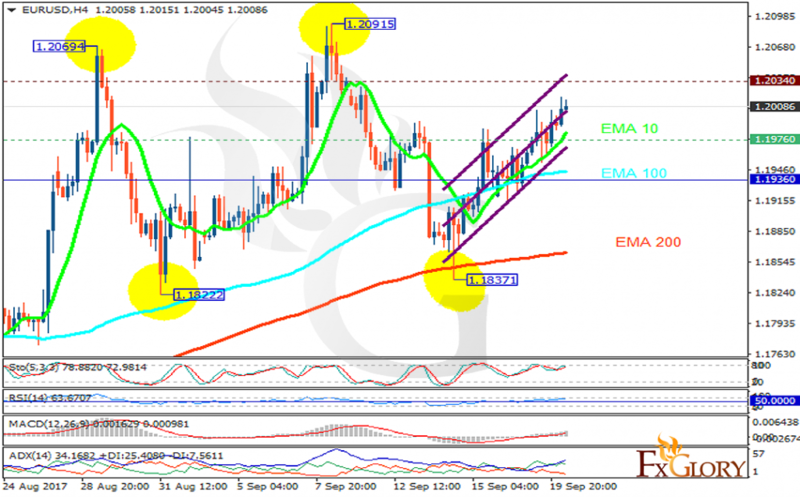 The support rests at 1.19760 with resistance at 1.20340 which both lines are above the weekly pivot point at 1.19360. The EMA of 10 is moving with bullish bias along the ascendant channel and it is above the EMA of 200 and the EMA of 100. The RSI is moving in the overbought area, the Stochastic is moving in high ranges and the MACD indicator is in positive territory. The ADX is showing buy signals. EURUSD will continue its bullish trend towards 1.21 area.